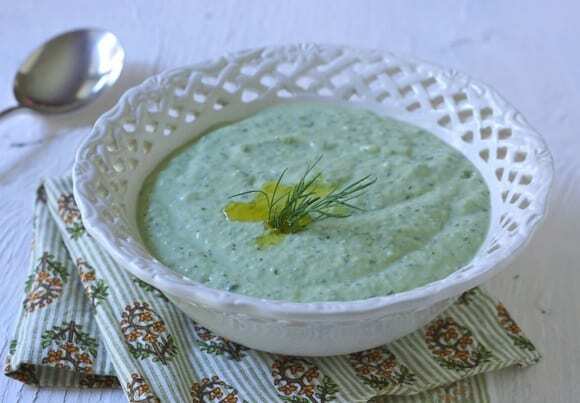 Chilled soup is an appealing start to a summer meal, whether you are serving two people or eight. This cucumber-avocado soup recipe can be doubled, but keep in mind it is best eaten the same day you make it. This soup is adapted from Ellie Krieger’s recipe for “Cool Cucumber Soup”, except that I added some Meyer lemon zest and juice – and the avocado, which gives a touch of richness to the soup. Some cucumber soups are a bit bland, at least to my taste. I prefer Greek yogurt for its thick consistency and extra protein. The avocado and Greek yogurt made the soup a bit thicker than I wanted, so I thinned it a bit with some vegetable stock. Add the stock tablespoon by tablespoon, until you hit the right note for you. The fresh dill is a “must” here, and the markets are full of healthy-looking bunches of dill. TIP: Use a fruity olive oil here so as not to over-power the other soup flavors. I like Trader Joe’s award-winning (but inexpensive) California Estate Olive Oil. A chilled cucumber and avocado soup for summer weather. Using either a food processor or blender, combine cucumber, avocado and scallions and process 1 minute. Add the yogurt, dill, lemon zest, lemon juice, salt and pepper. Pulse until puréed. Taste for seasoning. Add up to ¼ cup vegetable stock for desired consistency. Chill in fridge for about 4 hours to allow flavors to develop. Ladle into bowls, drizzle each serving with ½ teaspoon olive oil, garnish with dill sprigs and serve. You are lucky to have local olive oil! The avocado must have local too, what a treat! Hi Jayne – yes, lucky indeed. I’m not certain where in CA the olive oil is processed but the avocado came from a friend’s tree. I love your addition of meyer lemon and greek yogurt. A great way to enjoy our avocados right now! Lynda, thanks for teaching me to spell “avocados” – I was wondering if it should be “avocadoes”…I’m a terrible speller. This is the perfect summer soup on a hot evening, Liz! Hope you’re enjoying this summer weekend! I worked ahead a bit, Wendy, and shoot on Sundays now, when the workmen are gone. This looks so refreshing! Congrats on seeing the light at the end of the loo.